DC Water operates the Blue Plains Advanced Wastewater Treatment Plant, the largest plant in the world, providing wastewater collection and treatment services to more than two million Washington metro area customers. 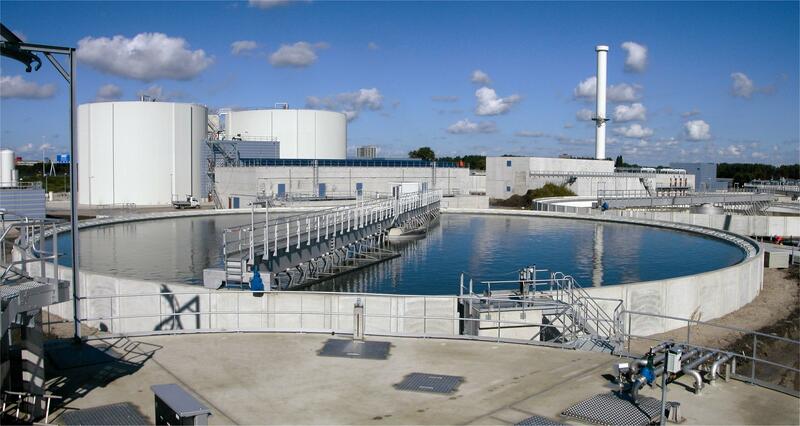 The plant has the capacity to treat 384 million gallons of sewage a day. The Blue Plains Advanced Wastewater Treatment Plant has been instrumental in protecting the environment since the beginning of plant operations in 1983. 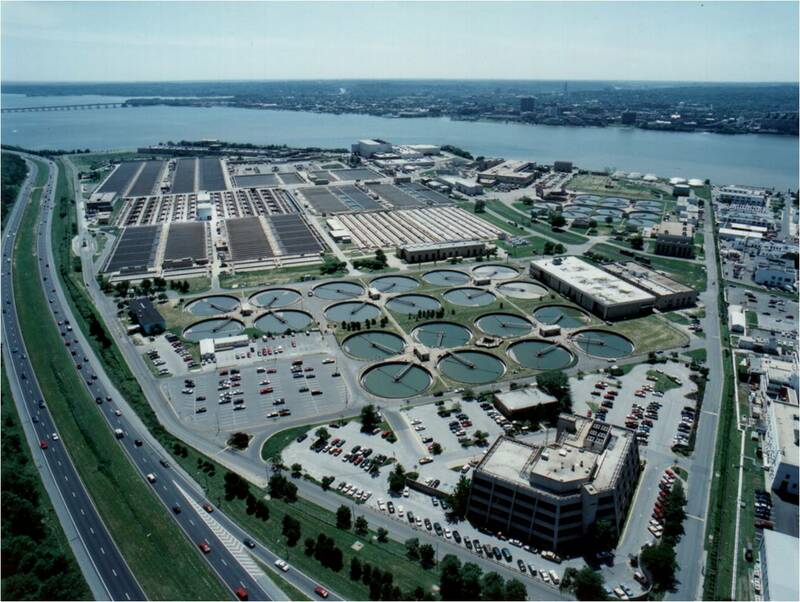 In 1996, DC Water assumed management of the Blue Plains Plant. The plant has received awards for peak performance from the National Association of Clean Water Agencies for more than 10 consecutive years, and in 2003, received an excellence in management award. The first treatment phase begins as debris and grit and are removed and trucked to a landfill. The sewage then flows into primary sedimentation tanks that separate more than half of the suspended solids from liquid. The liquid flows to secondary treatment tanks where oxygen is bubbled into it so microbes can break down organic matter. In the next stage of treatment, microbes convert ammonia into harmless nitrogen gas. Residual solids are settled out and the water is percolated down through sand filters that remove the remaining suspended solids and associated phosphorus. The water is disinfected, dechlorinated, and discharged into the Potomac River. The solids —or sludge— from the primary sedimentation tanks go to tanks where gravity causes the dense sludge to settle to the bottom and thicken. Biological solids from the secondary and nitrification reactors are thickened separately using flotation thickeners. The thickened sludge is dewatered, lime is added to remove pathogens, and the organic biosolids are applied to agricultural land in Maryland and Virginia as nutrient-rich fertilizer. DC Water is unique in the water sector in its scientific approach to integrating technology into planning and operations. The science and technology research arm of the Blue Plains Advanced Wastewater Treatment Plant is where personnel identify emerging technologies and keep an eye to upcoming regulatory changes. They investigate concepts, then plan and undertake scientific research, the most promising of which leads to recommendations for the Authority. From concept to recommendation typically takes up to five years and it may be another five years to implementation. This cycle of innovation to implementation exists for all major projects at Blue Plains. For example, before approval was secured for the thermal hydrolysis/digester project or Enhanced Nitrogen Removal project, many years of scientific inquiry, research, planning, modeling and evaluation were performed by the Blue Plains engineers. They formed the plan for the technology and the basis for the architecture and engineering of multi-million dollar, and first-of-its-kind, projects. It is noteworthy that many research projects are undertaken to advance the body of knowledge ahead of regulations, so that regulators and those in the water sector have a better understanding of impacts of effluent and biosolids on the environment. Womanium will provide gloves and safety glasses, when-if required. Photography might be prohibited in certain areas. Photography must be done only with permission. Students can expect to learn the science, technology, chemistry, fluid dynamics, mechanical, electrical, physical and osmosis background of different types of water purification methods and how waste water treatment is done at one the best and largest facilities in the world.